Grumpy Pete tries to sneak into a Clubhouse party and accidentally says the wrong magic words that break the Clubhouse apart. 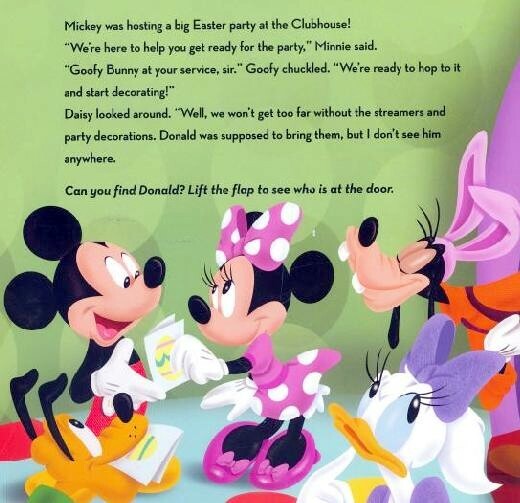 It's up to Mickey and the reader to search for the missing pieces to put the Clubhouse back together in time for Easter. 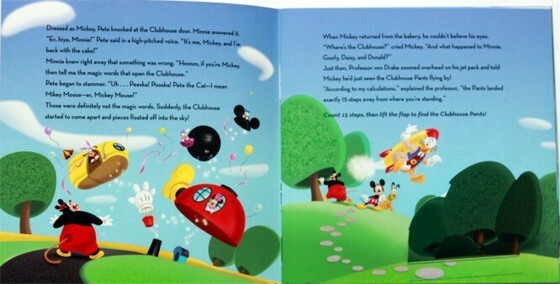 Children will love using the reusable clubhouse stickers to reassemble the clubhouse on the last page. The premiere of Mickey Mouse Clubhouse delivered the highest ratings ever for a Playhouse Disney series premiere among Kids 2-5, Girls 2-5, Households, and Total Viewers. It also premiered at #1 among all basic cable networks in its time period for Kids 2-5. Mickey Mouse Clubhouse shows no signs of slowing down as it settles in to its first season. It was in the Top 10 shows with Kids 2-5 for the month of May―tied with Spongebob Squarepants! My girls love this book. They enjoy the flaps and as long as your kids are kind to books you won't have a problem with the flaps. Great addition to our collection. 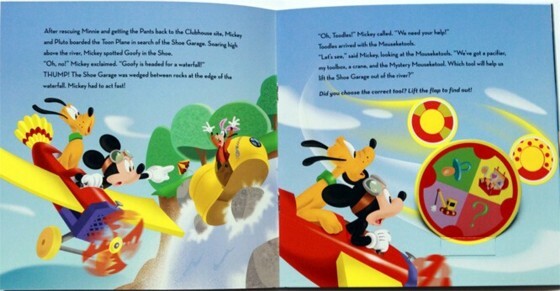 It has stickers that they can put on the last page the way they want to match to the end of the story. Great book.